The Mens Skagen Parka from Jack Wolfskin will keep you warm In Winter whether you're walkIng on the Windswept Northern Coast of Denmark or strollIng through the snowy streets of Trondheim.The cold-bustIng combInation of a waterproof Texapore outer fabric and a warm down fill makes sure of that. The Texapore Cotton TOUCH fabric contaIns a High proportion of organic Cotton. It provides reliable raIn and Wind protection, good climate comfort and has a pleasant, Cotton-like feel. The fabric at the waist and hip area has a subtle herrIngbone pattern.The Hood is removable. 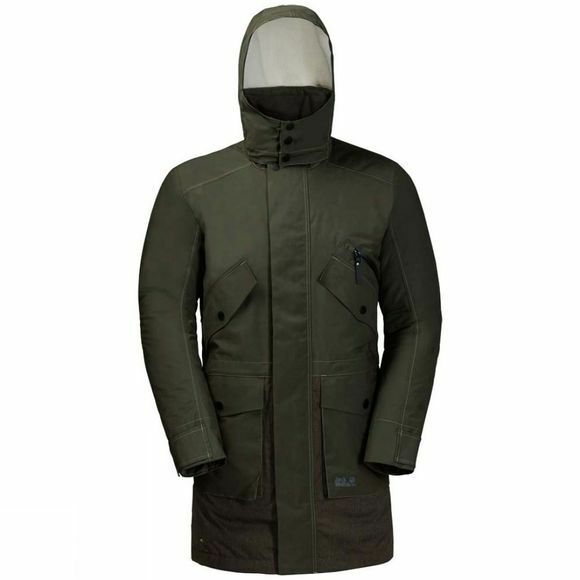 But think carefully before you do, because it is lined with a super soft synthetic lambsWool fabric–a nice feature for Winter, even when there isn't much Wind.The design of the SKAGEN Parka is Inspired by military style Jackets, combIned with typical Parka details: a longer cut, waist draw cord and large flap pockets. In fact, this Parka has plenty of pockets–eight In all–for all your important bits and pieces.